A rough and tumble Italian-American bouncer is hired to drive an African-American classical pianist to his gigs in a Jim Crow era South. It's 1962 and Tony Vallelonga (AKA Tony Lip and played by Viggo Mortensen), is an Italian American living in the Bronx, on hiatus from his job as a bouncer at the Copacabana nightclub while it undergoes renovations. But like any working class guy with a family, he's got to pay the bills so he takes on a two-month job driving Dr. Don Shirley (Mahershala Ali) to his concerts. Dr. Shirley is a renowned, classically trained pianist and the centerpiece of the Don Shirley Trio, and he travels the country playing at posh events to mostly white audiences. However, when Tony meets Shirley for his interview, the divide between the two is clear. Tony lives in a working class neighborhood; Shirley lives over Carnegie Hall in a posh apartment complete with throne which Shirley sits in while interviewing Tony. Where Dr. Shirley is refined, educated and elegant, Tony is rough, boorish and has a prodigious appetite (to earn a few bucks he takes on Fat Paulie (Johnny Williams) in a hot dog eating contest and beats him)! Tony is also a racist. When Tony's wife, Delores (played by a wonderfully real and warm Linda Cardellini), offers two black repairmen a drink of water, after they leave, Tony throws the glasses into the garbage. But as Maya Angelou once said, "When you know better, you do better." But it still takes Tony awhile. When Tony and Dr. Shirley begin their road trip, Tony regales Shirley with all of the stereotypes attributed to African Americans. For example, Shirley must love fried chicken, right? Wrong. He has never tried it. Tony is unabashedly himself: lacking in manners, subtlety or political correctness, whereas Shirley is the epitome of the gentleman and, naturally, he doesn't approve of Tony. But Shirley is also uptight and lonely. As this road trip/buddy film progresses and Tony experiences the racism that Dr. Shirley faces and Shirley comes to realize that Tony, despite his crudeness, is a good person, their feelings change about each other and a bond is forged between the two. This film, based on a true story, is a bit like a reverse "Driving Miss Daisy." And yes, there are some cliches and plot devices you can see coming from a mile away, but this film is so beautifully done and the actors so real and open, none of that will matter. You will be transported on this journey with them and love every minute of it. If you saw Mahershala Ali in "Moonlight" you won't recognize him in this. And if you saw Viggo in practically anything else he has every done, you won't recognize him either. And that's good because that means these two are wonderful actors and have created characters you have not seen them do before. The two together have an unforgettable chemistry and you won't be able to take your eyes off either of them. This is the directorial debut of Peter Farrelly, one half of the Farrelly Brothers, who brought us the funny but rather low-brow "There's Something About Mary" and the "Dumb and Dumber" films, but there is nothing low-brow or dumb about this film. Though this film has some of the humor of those earlier films, there is a lot more than that going on here. For one thing, it's a statement about white privilege. Dr. Shirley can be the star of the night, wowing the white elite with his piano playing. He can be erudite, refined, dressed in a tuxedo and still be refused service in the very restaurant where he was the main attraction and, afterwards, be relegated to seedy hotels when the night is over while Tony is welcomed with open arms everywhere no matter how he acts or how he is dressed just on the basis of his whiteness. Over and over we witness Shirley's humiliations in this film. But when Tony witnesses it first hand, it changes him. When I see films like this and am reminded of the cruelty a race of people has endured based on the color of their skin, I get so angry and I am getting angrier and angrier because it seems that even today nothing has changed. But at least this film gives us a glimmer of hope. We see that people can change, one encounter at a time. The film is also about family, identity, prejudice (and not just against black people), the Jim Crow South and the threat of being gay in the bad old days, but though the film has that serious side, the film is also funny and carries you along on this journey where two very different people from very different backgrounds form a special and lifelong friendship. The film was written by Farrelly, Brian Hayes Curry and Nick Vallelonga, Tony's real life son, who has had a long career as an actor, director and producer. My only complaint about this film is what I consider an unfortunate title. And that's only because I think the title might keep people from seeing this wonderful film. 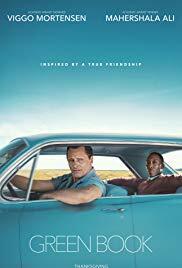 Though it's integral to the plot (a Green Book was a guidebook to help those "traveling while black" to avoid inherent dangers, listing restaurants and hotels that would take black people), few people probably know what a Green Book was and it doesn't really describe the film. I worry that people won't go see this film because of the title and that would be a shame because it's one of the best films of the year. And it's even sort of about Christmas. This might turn out to be your new favorite Christmas movie. Rosy the Reviewer says...ring...ring...Oscar calling! Brother and sister, Kate and Teddy Pierce, spend a magical Christmas Eve! It wouldn't be the holidays if I didn't include some holiday films, right? I mean, enough already with the terrorists and the vampire movie I am going to review next and all of the daily bad news. We need to BELIEVE! And that's what this movie is all about. The Pierce family living in Lowell, Massachusetts, loves Christmas as we see from a montage of home videos spanning 2006 to 2017. First little Teddy is the centerpiece but then a couple of years later the family is joined by his little sister, Kate. But now it's 2018 and things don't look good for Teddy and Kate. The tree hasn't been decorated, the house is a mess and the kids aren't happy. We soon figure out that Dad, Doug, has died and Christmas isn't going to be what it once was (Doug is played by Oliver Hudson - he is Goldie Hawn's son and Goldie has famously been in a very long term relationship with Kurt Russell, who plays Santa, so this film is a family affair!) . Naturally when it comes to Santa, teenager Teddy (Judah Lewis) is a non-believer but young Kate (Darby Camp) still believes and sends Santa a video letter. She is an intrepid and curious young girl who, when following her brother with the video camera, catches him out stealing a car with his thuggy friends. She video tapes it. Not a good start to the Christmas season. Worse, Mom, Claire (Kimberly Williams-Paisley) has to work on Christmas Eve, leaving Teddy and Kate to fend for themselves. Clearly things aren't the same since Dad died and basically things have gone to hell. Directed by Clay Kaytis, this is one of those "Is there really a Santa?/and Someone needs to save Christmas" movies like "Miracle on 34th Street," "White Christmas" and countless others. Here when Santa gets put in jail, it's up to Teddy and Kate to do just that - save Christmas. Oh, and, of course, we need to get Teddy to become a believer. This is how it all shakes out. Mom gets called into work on Christmas Eve. She needs to work because she has to support her family so she tells Teddy to look after his sister and off she goes. Teddy goes off to his room and Kate amuses herself by looking at old family Christmas videos. All of a sudden she sees something in one of the videos. It's a red arm with fur around the wrist and it's holding a present. What? Could that be Santa? Kate calls Teddy down to see it and, then Kate hatches a plan. Let's stay up and video Santa in the act! Though Teddy is skeptical, he agrees to Kate's plan when she offers to give him the video she made of him stealing that car. So they set up the cameras and some booby traps to alert them to Santa's arrival, stuff themselves with junk food and fall asleep. Soon, Kate hears the jingle jingle of one of the booby traps and, then, footsteps on the roof! Santa! Kate and Teddy run outside and see Santa's reindeer and sleigh and a figure leaping from house to house. Kate climbs into the sleigh, Teddy follows and before they know it they are flying off with Santa who doesn't know they are there. But when he realizes he isn't alone, he is so shocked that the sleigh crashes, Santa loses his hat (the hat allows him to fly) and the reindeer and sleigh fly off. There the three are - Santa, Teddy and Kate - lying in a park in Chicago and no way for Santa to deliver the rest of his packages. According to Santa the Christmas Spirit is fading fast. What will happen if he can't make his rounds? Well, according to Santa, the last time that happened the Dark Ages descended! So someone has to save Christmas! So what do you do when you need to get into Chicago to find your reindeer and deliver packages? Why you steal a Dodge Charger and speed into town but when they get caught by the police and Santa goes to jail, it's up to Teddy and Kate to save Christmas. Of course we know that Christmas will be saved and non-believers will be believers. I mean, who hasn't seen the aforementioned "Miracle on 34th Street" and all of the Christmas clones since then? But even though we know how it will end, it's the journey that will decide the success of the film. Is the journey to that known ending worth the ride? 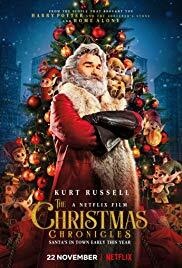 Kurt Russell is a fun Santa (he actually gets to rock out and sing with Little Steven and The Disciples of Soul); I actually liked the kids (and you know how I feel about precocious children in films); someone makes a surprise cameo appearance as Mrs. Claus (remember, I said it was a family affair! ); and the film moves along at a rapid pace There is also a good message: You don't need to just believe in Santa, you need to believe in yourself. But ultimately, I think it will appeal mostly to young children. For older folks, it's a bit silly, though I have to say, I loved the reindeer. Rosy the Reviewer says...best for little kids but if you are a Kurt Russell fan, you might enjoy this. For us older folks? I, for one, am not adding this to my Christmas movie repertoire. I'm sticking with the classics! Allen Gray (Julian West) is obsessed with the supernatural so what a coincidence that he ends up in a creepy town where a young girl is turning into a vampire. 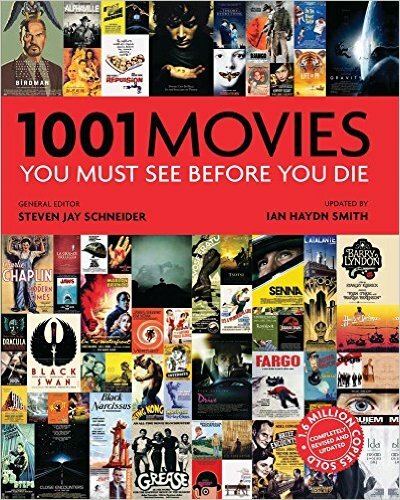 Note: I know this isn't very Christmasy but holiday season or not, I must continue with my 1001 Movies Project! This is one of those early films that was somewhere in between a silent film and a talkie. The film still utilized intertitles (printed words on the screen), but there was also audible dialogue, though not often synchronized with the characters, mostly voice overs. Allen Gray is a bit of a drifter who studies the supernatural. While wandering around (we don't know why or where he has come from), he encounters an inn where he gets a room. In the middle of the night he is awakened by an elderly man (again, we don't know why or where this guy has come from either) who proclaims "The girl musn't die" and leaves a parcel labeled, "To be opened in the event of my death." Later Gray wanders over to a house (this guy likes to wander) and discovers that the old man's daughter, Leone (Sybille Schmitz) is suffering from some strange anemia (uh, she has a bite on her neck!) and then the man is murdered so Allen opens the package, discovers a book about vampires and all hell breaks loose. Directed by Carl Theodor Dreyer, this film was considered to be one of the greatest of all horror films. If by horror they mean creepy, OK, then this is horror but it wouldn't stand as anything very scary today. However, it's loaded with atmosphere and the later Dracula films are written all over it. There is also an amazing sequence where Gray imagines his own death. West is a strange hero in that he doesn't seem to be too upset or amazed by the strange scenes he encounters. This is probably because Gray is played by Julian West who was not an actor but the Baron Nicolas de Gunzburg who agreed to finance the film if he could star in it. The cinematography is dreamy and gauzy. I was wondering why it was so fuzzy only to learn that the photography was achieved by placing a gauze filter over the camera lens to achieve a dreamlike state. In fact, the whole film is very much like a dream, a very bad dream. 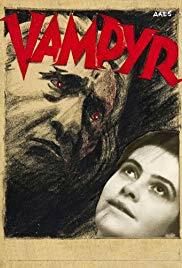 Why it's a Must See: "The greatness of Carl Theodor Dreyer's first sound film derives partly from its handling of the vampire theme in terms of sexuality and eroticism, and partly from its highly distinctive, dreamy look...If you've never seen a Dreyer film and wonder why many critics regard him as possibly the greatest of all filmmakers, this chilling horror fantasy is the perfect place to begin to understand." Rosy the Reviewer says...I guess I understand, but though this film is very dreamy and beautiful to look at, haunting even, if you are a fan of modern horror this probably wouldn't scare you too much. Sir Michael Caine catches us up on his amazing life and shares what he has learned about acting and about life. I remember when I first saw Michael Caine. It was when he starred in the 1966 film "Alfie," and I remember thinking, what a strange looking leading man (I was precocious for a teen). And his acting style was so underplayed and his Cockney accent so thick, I didn't get him at first. But by the time the film was over, I was hooked and I have been a Michael Caine fan ever since. This is not his first memoir and he has also written a wonderful book about acting in films. This one is both and more. It's a primer for students of acting (how not to look shifty on camera, if you aren't Marilyn Monroe or Elizabeth Taylor, don't keep people waiting, the importance of preparation and other important tips), but it's also a self-help book for the rest of us. He talks about how to be a successful working actor and then applies those principles to life. And for those of you who like dishy celebrity memoirs, don't despair. There are also plenty of fun anecdotes about Caine's 50+ year career. 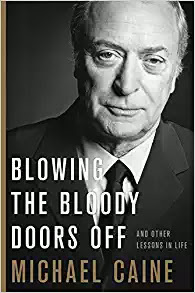 At 85, Caine has much to share and it's inspiring stuff. "I wanted to look back on my life from the Elephant and Castle to Hollywood, and from man-about-town Alfie to Batman's butler Alfred, with all its successes and all its failures, all its fun and all its misery and struggle, its comedy, its drama, its romance and its tragedy, and find, among it all, the lessons I've learnt and want to share, not just for aspiring movie actors but for everyone." Just a reminder to be nice. Remember that old saying that goes something like, "Be nice to people on the way up because you may meet them on the way down?" He illustrates that beautifully with a story about being on a film set before he hit it big. In those days, a bus would bring tourists through and they were allowed to get out and mingle with the actors during filming and get autographs. However, the actors didn't like that and would usually hightail it out of there when the bus arrived. Caine talks about one particular bus driver who was a go-getter and very adept at arriving at key times so his passengers could try to meet as many actors as possible. One day after most of the actors had taken off, Caine decided to make the bus driver look good and stay and sign autographs. That bus driver was Michael Ovitz who...wait for it...became President of the Disney Company. Basically he believes when life hands you lemons, make lemonade. "Whatever it is, give it 100 per cent"
We've heard that before but I like how he explains it. Even if you have a bit part in a movie or a "bit part" in your chosen profession, he says, "It's the small-time experience that adds up to the big-time ability...your part may not be the most important part in the movie, but it is the most important thing to you...The same goes whatever you're doing, in whatever walk of life. However scaled down your role is, do not make that a reason to scale down your effort." Many of his lessons just seem like common sense, but if they are so common and make so much sense, why aren't we all doing these things? The book is a great reminder to be our best selves. There is a reason Michael Caine has had such a long and successful career. He follows his own advice and people want to work with him. And he is a popular actor with audiences. We like Michael Caine. And this book is the evidence. He's just a really good guy who has learned a lot in his 85 years and we are fortunate that he is sharing what he has learned in this witty, self-deprecating and charming book. Rosy the Reviewer says...I enjoyed every minute of my time with Sir Michael!